KINGSTON, Jamaica — Edwin Allen speedsters set the pace in the girls 100 metres semi-finals at Champs 2019 on Friday’s fourth day of competition at the National Stadium. With less than Maximum effort, Tia Clayton posted a time of 11.84 seconds to take the second of the semis, while her sister Tina was just as comfortable when she returned 11.85 seconds to take the third semi-final heat. The pair though, qualified behind arch-rival Brianna Lyston of St. Jago High who ran 11.72 seconds to win heat one. These three athletes were the only ones to dip below the 12-seconds barrier in the semi-finals. Meanwhile, another Edwin Allen junior standout, Kevona Davis, ran 11.52 secs to post the fastest time in the Class Two girls 100m. Davis, who set a record time of 11.16 secs to win gold last year, will be hoping to rival those achievements as she hunts maximum points for the defending team champs. Sashieka Steele of Holmwood ran 11.66 for second place to Davis in her heat. 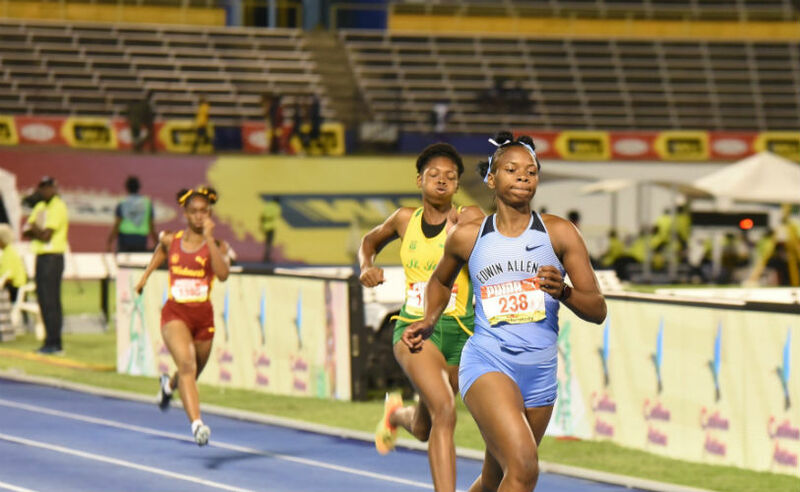 Ackera Nugent from Excelsior also ran 11.66 when winning the third semi-finals, while Krystal Sloley of Campion College looked very impressive when winning her semi-final heat in 11.77. Both Edwin Allen and Holmwood will have two athletes each in this final. Ashanti Moore of Hydel High ran the swiftest time in Class One and the fastest of the day overall after she stopped the clock at 11.39 to win her semi-final. Ockera Myrie of Petersfield High won the second semis in 11.70, just ahead of Lashawn Haye from Rusea’s High with a time of 11.72. In Class Four, Immaculate’s Toniann Bryan posted the quickest time in the semi-finals after she won semi-final two in 12.47 seconds. Kryshell Hoolong of St. Jago who came through a re-run in the heats, booked a place in the final after taking second to Bryan in 12.67. Qualifying second fastest was Sashauna Smith of Vere Technical who won the first semis in 12.54. Tamara Bailey from St. Jago ran 12.64 for second place to Smith. Abigail Wolfe of Holy Childhood took semi-final three in 12.58, just ahead of Monique Stewart of Rusea’s High (12.63).